It’s all thanks to the Spanish ambassador, really. Angeles and I were at the Spanish Consulate in Fukuoka, Kyushu’s biggest city, to pick up her new passport. By midday, we’d done the business, slurped our way through the obligatory bowl of Hakata ramen, and were looking for a way to fill a few hours till it was time to catch the train back home. “There’s a lovely shrine just 20 minutes’ train ride away,” said the nice Japanese lady at the consulate, which was actually just an alcove in the offices of the General Medical Co. Ltd. Twenty minutes? That sounded a bit further than we could be bothered going. “We took the ambassador there when he visited Fukuoka, and he loved it,” she added. There was something alluringly Graham Greene-ish about following the trail of the Spanish ambassador to a mysterious shrine on the edge of town, so toot sweet we were on the train bound for Dazaifu Tenmangu. What the nice consulate lady hadn’t prepared us for was the extraordinary story behind Dazaifu Tenmangu Shrine. 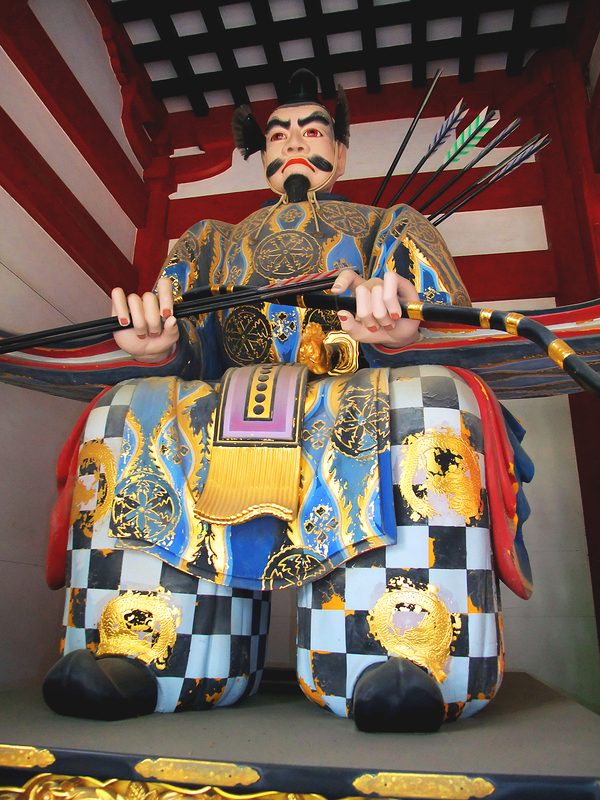 In all Japan’s vast pantheon of larger-than- life heroes, few can be more curious than the one encountered there. The saga involves political skullduggery, the supernatural — and a gifted child who became a god. It’s also a story that still inspires thousands of young Japanese who flock to Dazaifu around exam time every year to pray for good results. By age 11, he was composing poetry in Chinese characters, for which he showed an extraordinary talent. He later proved to be a gifted statesman, and rose to a position of influence in the Imperial court, then dominated by the Fujiwara clan. 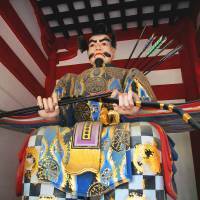 The Fujiwara clan became jealous and conspired with Minamoto-no-Hikaru, an envious rival at court, to convince the Emperor that Michizane was plotting against him. They succeeded in getting Michizane banished to govern the distant outpost of Dazaifu. Here’s where it gets a bit like a scene from a Garcia Marquez magical-realism novel. Legend has it that Michizane’s plum tree missed him so much that it uprooted itself and flew to Dazaifu to be with him. This tree, known as the Tobiume (Flying Plum Tree), still stands to the right of the Honden (Main Shrine) at Dazaifu Shrine. In 903, after less than three years languishing in the sorrowful hardship of exile, Michizane died in Dazaifu, aged 57 — many say of homesickness. His funeral procession consisted of just his loyal follower, Yasuyuki Umasake, and a few neighbors. 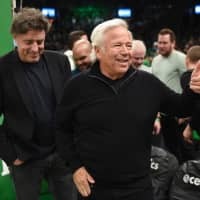 His coffin was carried on a wagon hauled by an ox. At one point, the ox suddenly lay down and refused to budge. This was taken as a sign, and Michizane was buried where the ox stopped. Today, a bronze statue of the exhausted beast is sited on that spot in the grounds of the shrine. You’ll notice that its horns and head are shiny from the visitors’ custom of stroking them for good luck. Two years after Michizane’s death, his loyal follower Umasake built the first shrine there. In 919, the Fujiwara clan erected a larger shrine over his grave, but it was burnt down in one of Japan’s civil wars. 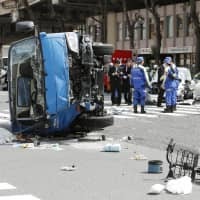 Meanwhile, back in Kyoto, in a perfect demonstration of what John Lennon meant when he sang “Instant karma’s gonna get you,” spooky disasters began to strike those who had plotted against Michizane. The Emperor’s palace burned down in fire triggered by lightning. Fujiwara-no-Tokihira, Michizane’s chief rival, died of a mysterious disease. A Fujiwara official was struck dead in a storm. The son of Emperor Uda became so ill he had to retire. Many believed these disasters were caused by Michizane’s wrathful ghost, reeking revenge on those who had cut short his career, and his life. 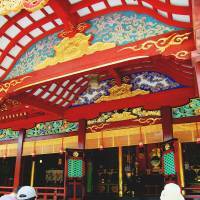 To appease his spirit, the splendid Kitano Tenmangu shrine was built in his honor near Kyoto. Emperor Ichijo posthumously restored Michizane to his former office and rank and later promoted him to the highest office. Ultimately he was deified and worshipped as a god, under the name of Tenman Dai-jizai Itoku Tenjin — meaning, Heaven-pervading Almighty and All-glorious God. That being a divinely big mouthful, it’s generally shortened to just Tenman Tenjin. And what can you expect to see at Dazaifu today? Well, the complex begins a mere 250 meters from Dazaifu Station. You first pass under a giant torii spanning the road to the shrine, a long street crammed with traditional-style shops selling Hakata dolls, fans, kimono, bags of dried fish, chikuwa fish cakes and umegae- mochi rice cakes. Before we even got to the shrine building, the natural beauty of the extensive 35-hectare grounds was soul-inspiring. Tenmangu shrines are characterized by their plum trees, in honor of Michizane’s love of their blossom. At Dazaifu, there are more than 6,000 of them, which makes for a spectacular sight in spring. Ancient kusunoki (camphor) trees there are also there aplenty, including one towering specimen to the left of the shrine. Angeles fell into conversation with a young miko (shrine maiden) in her white blouse, bright red trousers and long ponytail. She informed us that the colossal camphor is more than 1,000 years old — in which case the Battle of Hastings (1066) wasn’t even a twinkle in some Norseman’s eye back when it first photosynthesized. 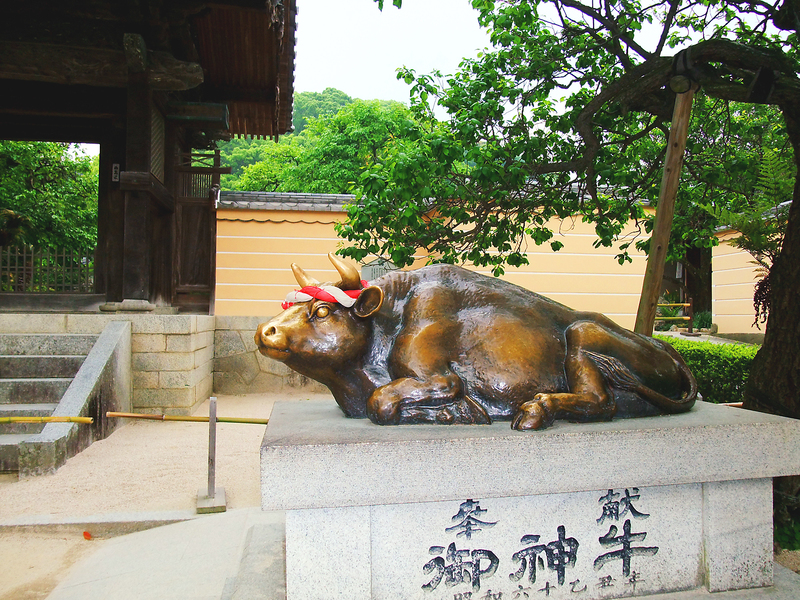 Statues of oxen are another characteristic of Tenmangu shrines, and we made sure to give Dazaifu’s weary bronze bovine a pat for good luck. 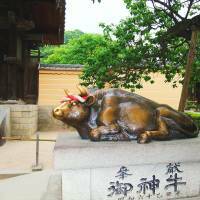 However, other animal statues abound around the grounds, including ones of birds, deer and, most curious of all, a horse-sized kirin — a fearsome mythological creature which looks like a cross between a lion and a unicorn. 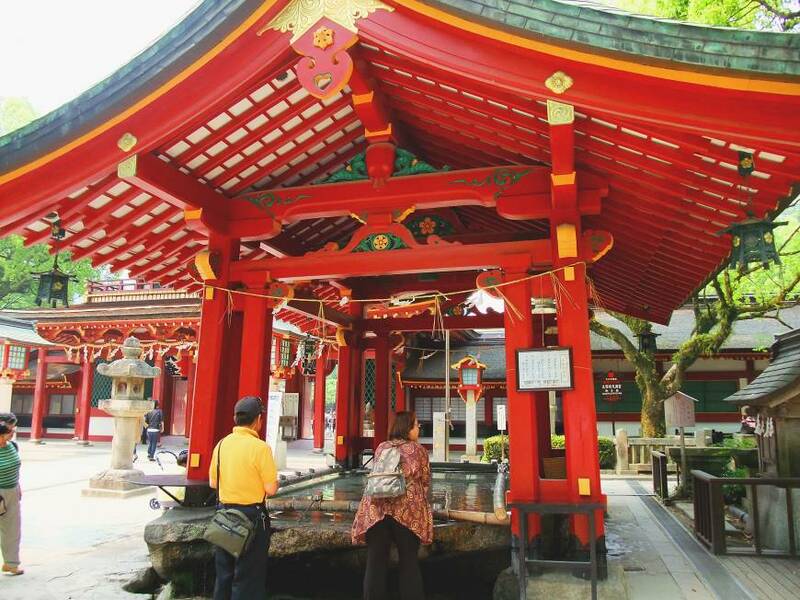 To get to the main shrine you have to cross over the crimson Taikobashi — a two-arched bridge symbolizing past, present and future — which traverses the delightful Shinji Pond that’s shaped like the kanji for shin (heart). Fountains play on the waters, shared by turtles, swans and koi while, to the right, is a tranquil iris pond named Shoubuike. As in all good Japanese gardens, water occupies an integral role in creating a sublimely meditative atmosphere. Wending our way through this wonderland, we passed through a gate guarded by two giant statues of archers. 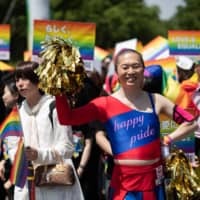 They are so brightly colored as to look almost jovial compared with the snarly pair of nio (those huge, half-naked musclemen that guard Buddhist temples) which they replaced in the Meiji Era (1868-1912). Yes, yes, but — I hear you ask — what about the Flying Plum Tree? Well, sure enough, when we finally got to the Main Shrine, there it was to the right — the fabled Tobiume said to have flown here to be with Michizane. That makes it even older than the camphor tree. Our miko friend assured us that the Tobiume is always the first plum tree to blossom, as early as January each year. To the left of the shrine, meanwhile, stands a another one donated by the mother of Emperor Taisho as an offering for the sickly chap’s recovery. We threw some coins in the huge offertory box and muttered our wishes before the magnificent shrine, which dates from 1591. 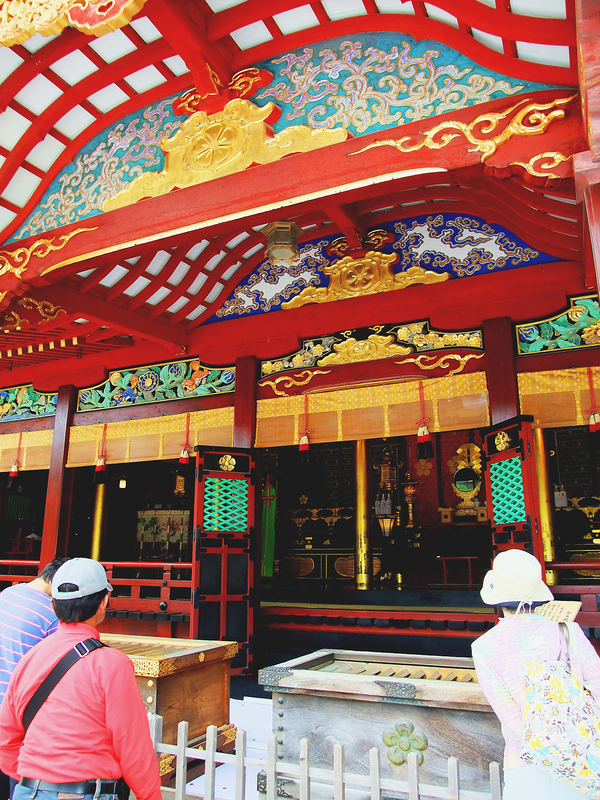 With its red columns, gold-leaf patterns and huge, sweeping roof, the gorgeously ornate structure is a stunning example of architecture from that period when warfare raged throughout Japan. Unsurprisingly, it’s now a designated national treasure and the nation’s foremost Tenjin shrine. Taking in the beatific marvels of Dazaifu Tenmangu, it’s worth remembering that Michizane is celebrated as a man of pure heart. As for those 10th-century disasters, Chinese writer Chiang Yee wrote: “I don’t think Michizane’s spirit caused those calamities, for he showed no grievances during his years of exile.” In fact, as befits the god of learning, he dedicated his exile to study, rather than plotting revenge or harboring hatred. He is still revered as the god of learning, literature and calligraphy. As Miki Teicki wrote: “Scarcely is there a town in which his temple is not seen.” Indeed, in Japan today, there are more than 10,000 Tenmangu shrines dedicated to his deified spirit. 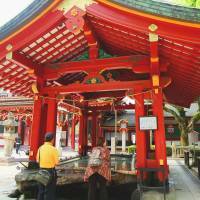 And for sure, even if your student days are far behind you, a trip to Dazaifu Tenmangu Shrine is still a rewardingly educational experience.